I enjoy baking but I’m not quite Bake Off standard and one of the things I’ve tried to do more of is free from baking. I have lots of friends who have food intolerances (as do I) so I like to make sure they feel catered for if I’m having them round. 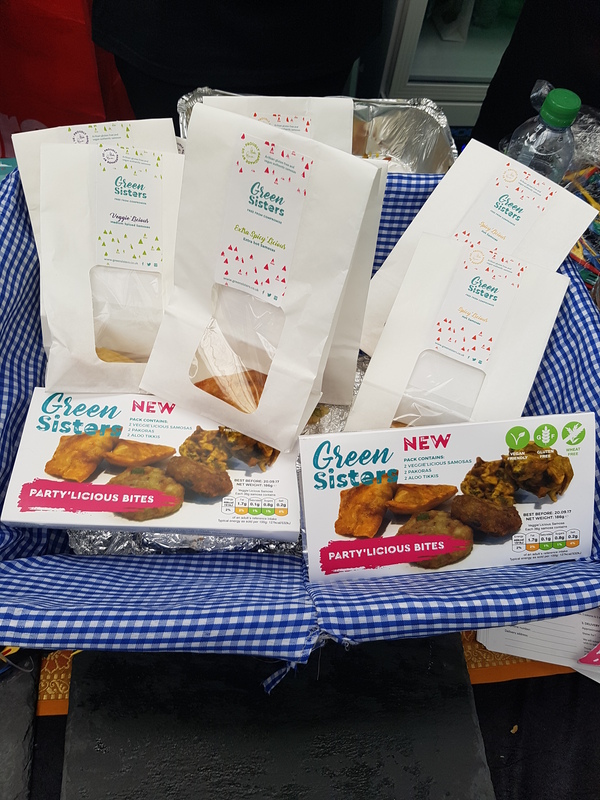 When the team at Indigo Herbs got in touch about using their natural, free from ingredients I said yes please! 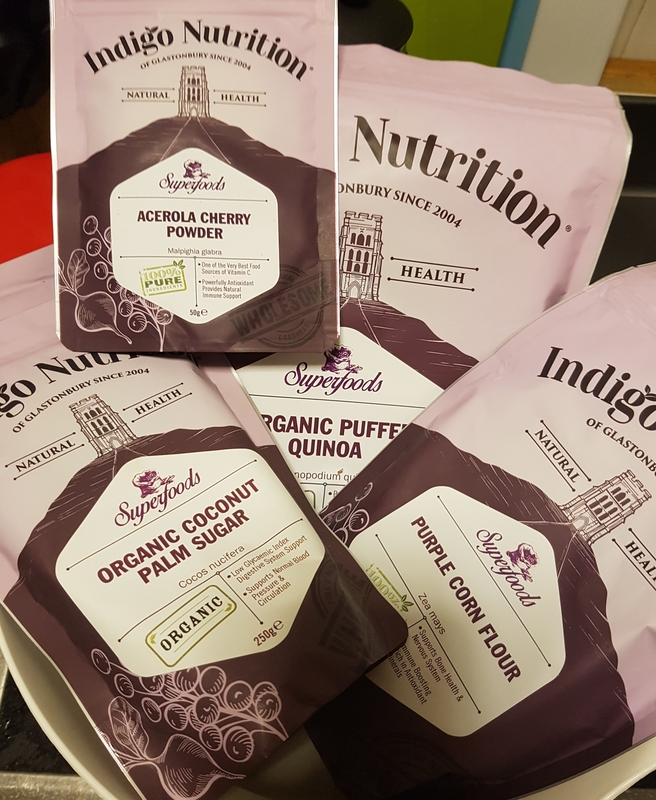 Indigo Herbs is an independent business located in the heart of Somerset, in Glastonbury and has a huge range of interesting products available online and in store. Plus they’re friendly, which is always a bonus. Everyone loves chocolate brownies and chocolate pairs really well with cherries so combining the two was a doddle. 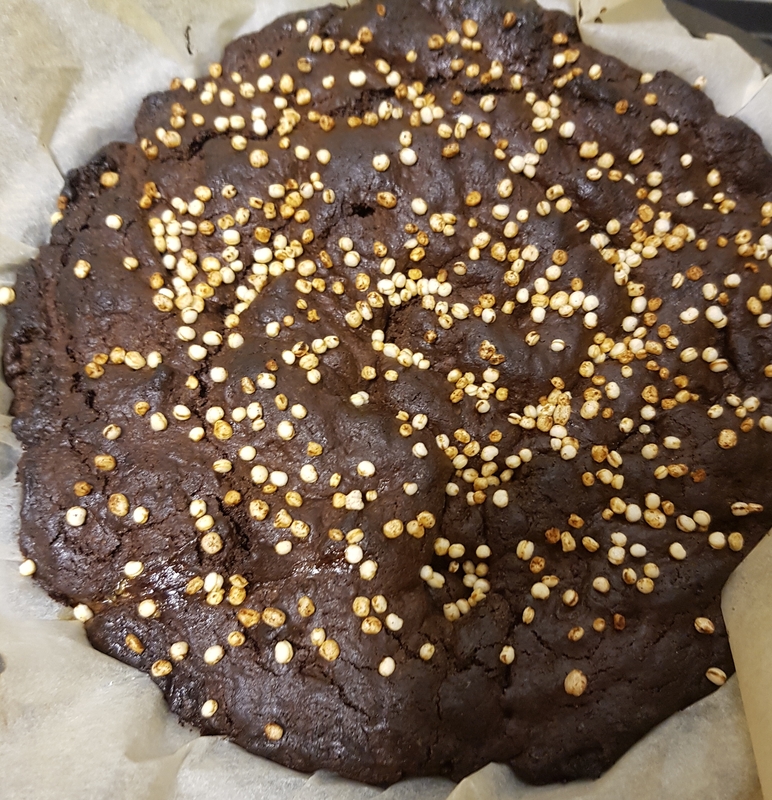 This bake is vegetarian but not vegan as I’ve yet to find an egg substitute that works as effectively without leaving any trace. Oven on 200°c and locate cake tin (I used a loose bottom one), line with baking parchment. Weigh and measure your ingredients – do not drop any of them on the floor. 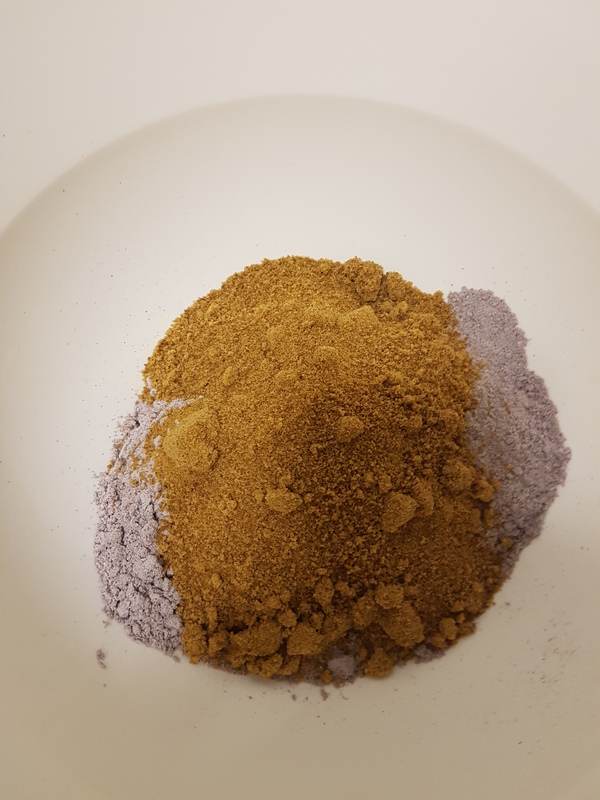 Mix your dry ingredients in a mixing bowl (I used a spatula but you could use your electric mixing bowl/whisk – I could only locate 1 prong attachment thing). Melt the coconut oil and chocolate in a bowl in the microwave – this takes about 3 to 4 minutes. You could use a Bain Marie but that takes longer and requires more room in the kitchen and the brain. 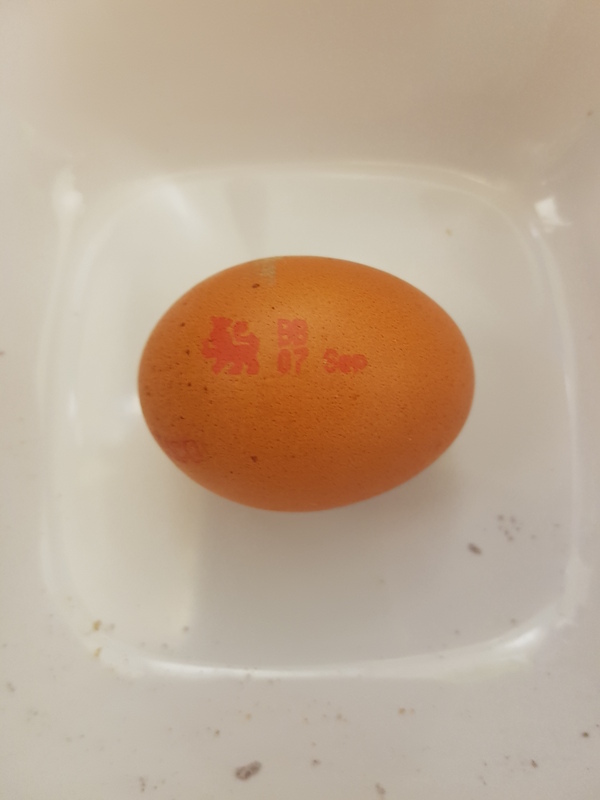 Add the eggs to the dry mix, do not get any shell in there. If you do, fish it out, wrong kind of tasty surprise. When the oil and chocolate have melted, pour it in. Be careful the bowl will be hot. Mix everything together. Add the glacè cherries. Stir them in. You would be best to do this bit by hand. You could be really clever and coat them in a little flour first so they don’t sink. I forgot to do this. Pour into the lined brownie tray (or a cake tin like I did as my brownie tray is huge) and smooth the top. Or leave it slightly uneven if like me, you’re lazy and perfection is tiring. Sprinkle the popped quinoa over the top. This provides a nice little crunch – a textural opposition to the soft brownies. Pop into the oven for 20-30 minutes. Check whether a knife comes out clean. If it does, then it’s done, if the knife is sticky, pop it back in for a few minutes more. Ovens (and cakes) can be unpredictable. Do the washing up or load the dishwasher and thank whoever invented this life saver. Once the baking is done, take it out of the oven (switch the oven off – no one ever tells you to remember to do this in recipe books). Leave to cool in the tin for a few minutes as it will be soft. Then carefully transfer to a cooling rack (I got a set of three of these on Amazon – you’re welcome). Once cool, you can decorate with more cherries or just slice and serve. Cream or custard (dairy free if preferred) go well with this. Obviously you can skip the cherries or swap them for something else, try popcorn instead of quinoa, add extra chocolate, make a bigger batch. Basically, make it your own. Then send me the results – cake by post. My independent taste testers gave this tasty treat two thumbs up, so give it a go. 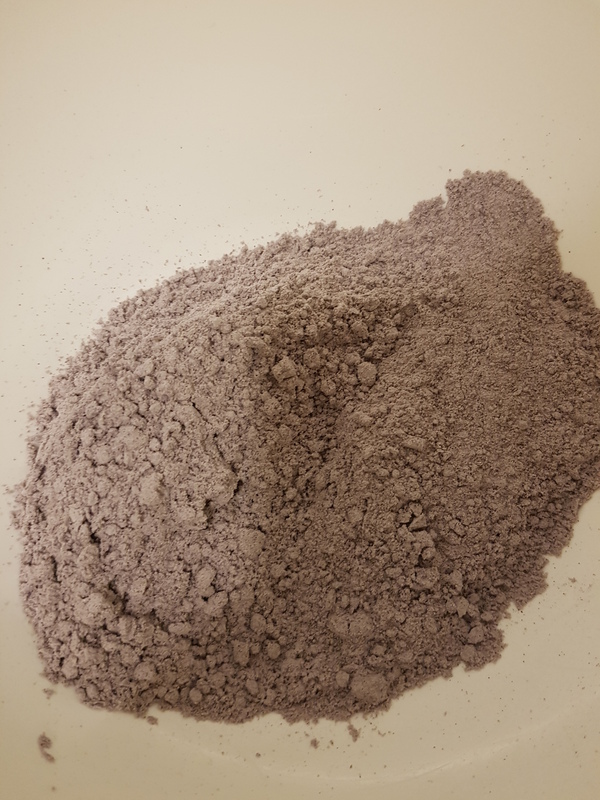 *items provided by Indigo Herbs for the purposes of this recipe post. All opinions and recipes my own. This past Saturday my mother and I went on one of our increasingly common outings. 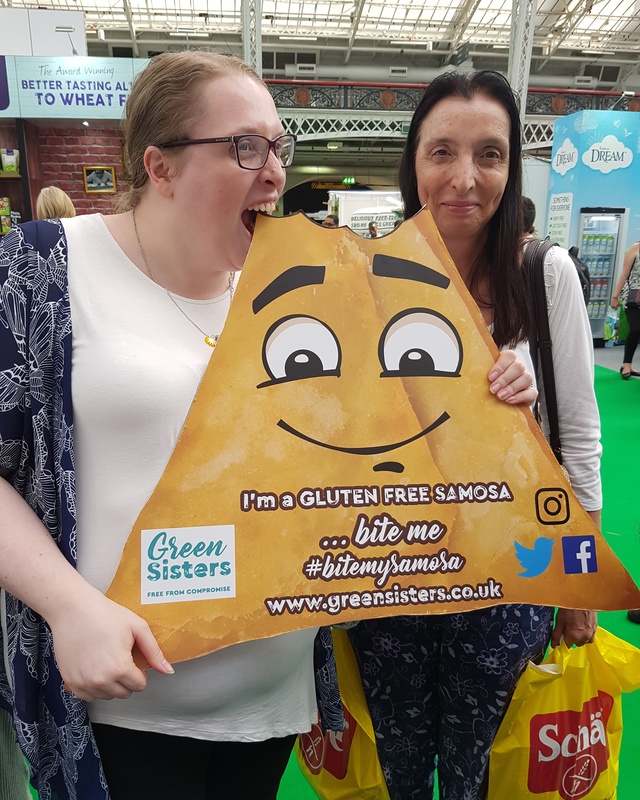 This time we went to Kensington Olympia to explore free from foods and allergy busters. When my mum isn’t buying me lunch (thanks!) she’s an incredibly hard-working and somewhat brilliant nurse working in public health and school health. She recently celebrated 40 years in nursing and is my go to for any ‘should I take this weird thing to a doctor’ query (lucky her). We had free tickets because the event gives loads away every year – I will share the link for next July once I get it. I did however miss the blogger meet up because I was too busy sampling cakes, oops. I also failed miserably to take any photos of use, although I will include the entirely random few I did manage at the end. Seriously I blame all the free cake samples and the abundance of dairy free treats. I had a truly delicious magnum style caramel ice cream and got chocolate all over my white top – I shouldn’t be allowed out. We did stop for actual lunch too – the prices in the Olympia’s cafes are eye watering for two salads and two drinks. My mum became pals with an allergy nurse from a children’s asthma charity – discussing epipens and inhalers. Joy. I located the make up stand and got a bit of a makeover while I was at it – once a beauty blogger, always a beauty blogger (this will be getting it’s own post so stay tuned). 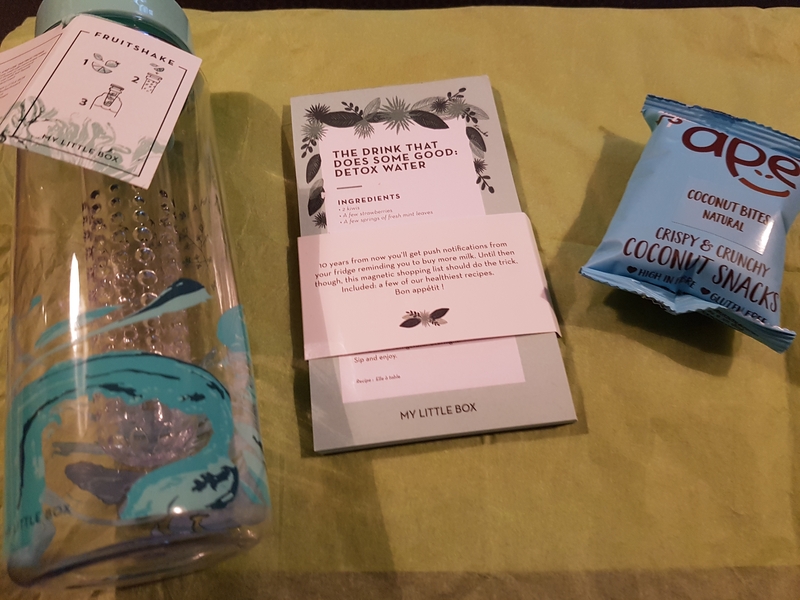 I even came home with not just a goody bag full of snacks but some little purchases including gluten free samosas, rocky road mix, vodka cocktails (mum and I split 4 between us, she enjoys the odd tipple and free samples) and a few other little bits and bobs. I also found some new and some familiar brands to add to my shopping list. 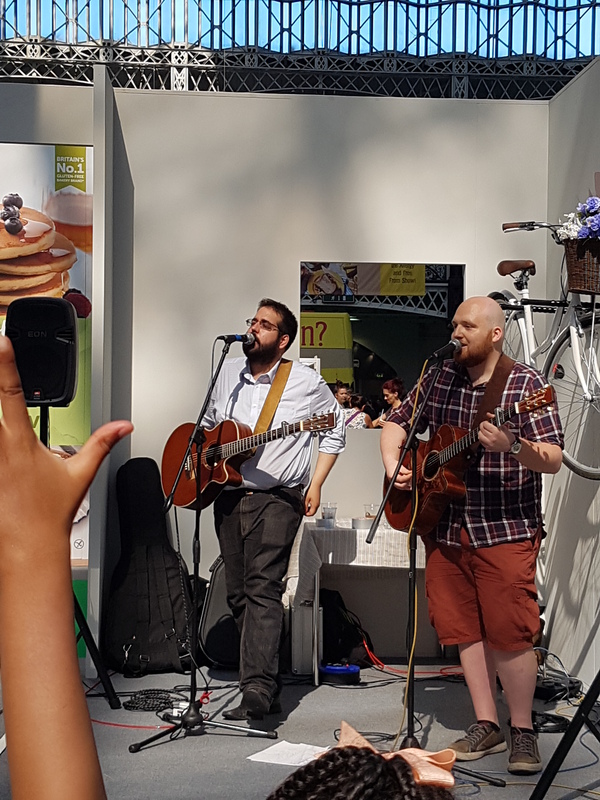 There was some live music from the imaginatively named Thomas and Thomas who played cover versions of a range of songs that definitely had at least one fan – the little boy dancing away in front of them! They were actually quite good but the dancing was very entertaining and quite distracting. We were ambushed by the man from the WWF and spent the rest of the day not walking past him again. I know why charities rent stands at these events but I wish they wouldn’t. I managed to get us lost finding the cocktails stand when we decided to make our purchases before leaving, thank goodness we found them again! Maps are very much not my strong point, though I can scent a goody bag at 500 paces it seems. Anyway, it was really interesting to see how far the free from and allergy market has come along since I was a sniffly asthmatic kid with eczema now that I am a sniffly asthmatic adult with eczema. 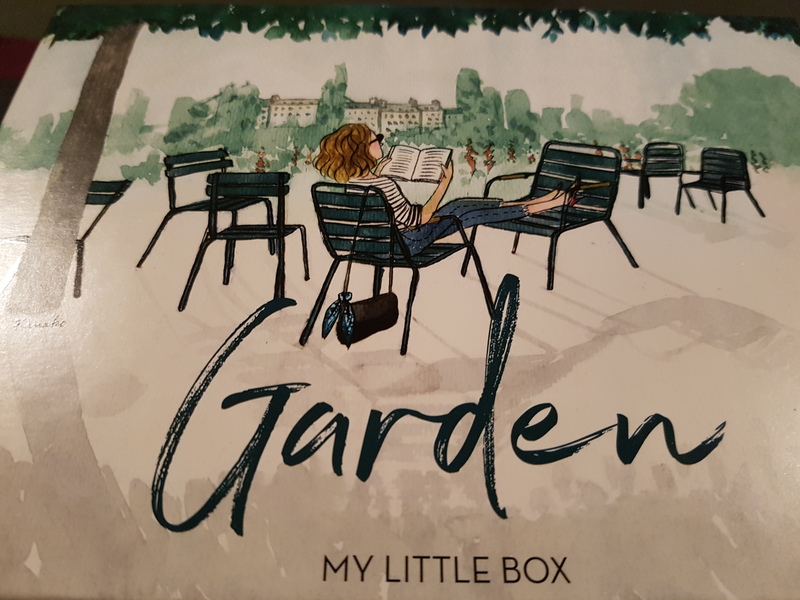 This is April’s box, the reason for the delay was because I wanted to take photos of my box in the wild – I don’t have a garden but the bonkers weather meant I couldn’t get a break to find some grass and take some snaps. Let’s dive in. This garden to table lists the vegetables and fruit in season for every month. Eating seasonally is something I try to do – it works out cheaper when there’s an abundance and you get the best of the crop, sweeter strawberries in June for example. I have a larger version of this infuser bottle somewhere, pop your favourite fruits in the infuser core and fill the bottle with water. My favourite fruit combo is lime and watermelon – so refreshing. 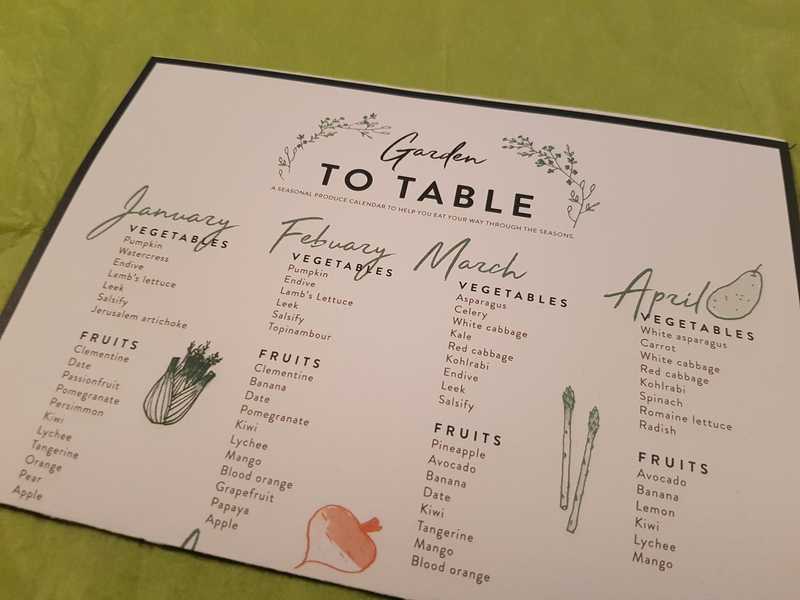 Recipe cards/magnetic shopping list – this has some of the MLB team’s favourite fruit based recipes and then pages to pop your shopping list on with a magnetic backing to stick neatly on the fridge. Ape Crunchy Coconut Bites – tasty little discs of crunchy coconut – yummy. 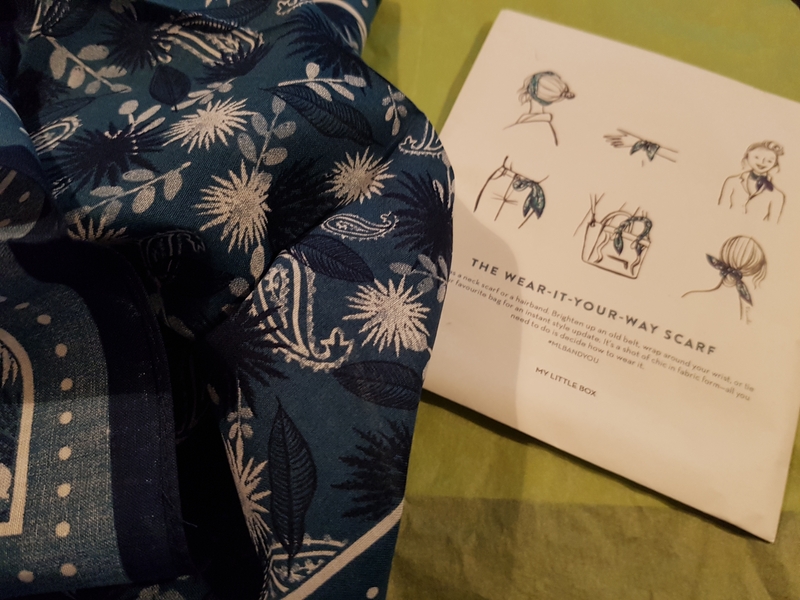 A floral patterned green and blue square scarf which can be worn in a variety of ways – the last scarf MLB sent out is a firm favourite so this one will be too. This month’s beauty treats are all skincare savers. 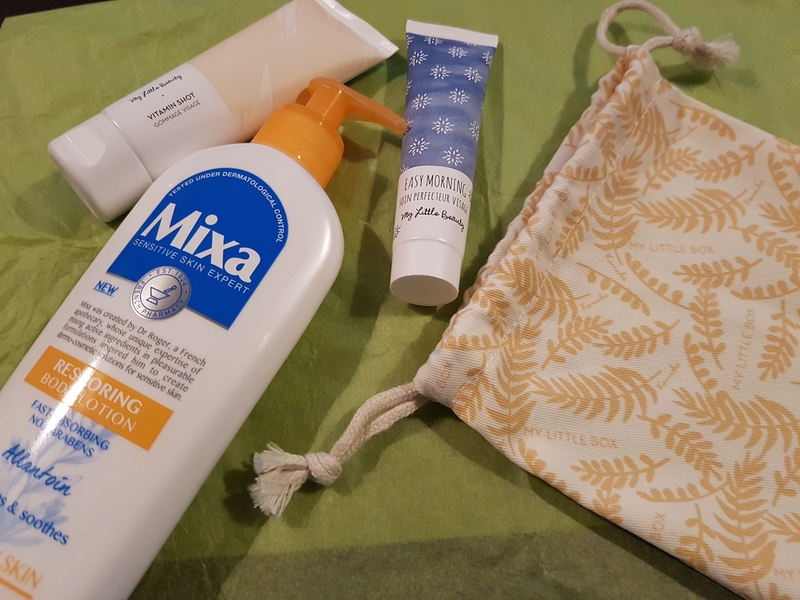 Mixa is a French skincare brand now available in Superdrug (home of many a beauty bargain). 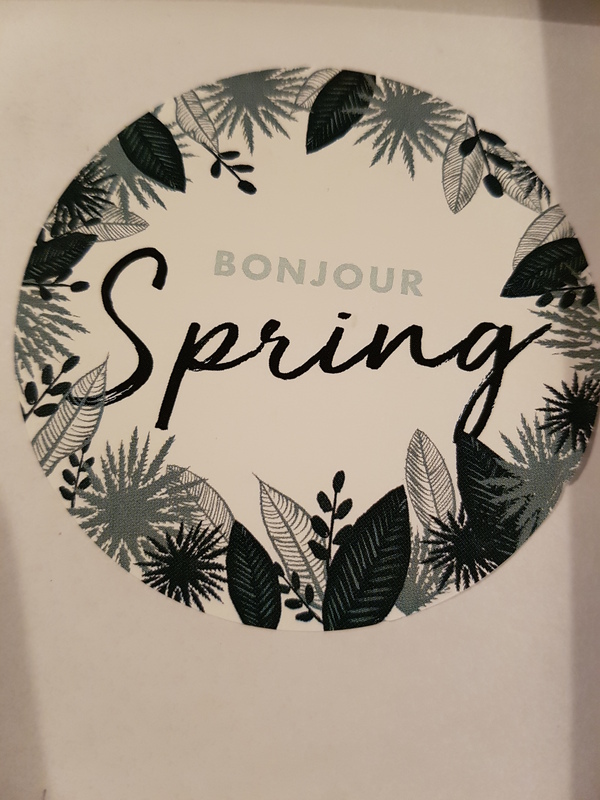 Suitable for sensitive skin (yay) this dermatologist tested paraben free moisturiser can be used all over – giving you soft summer skin. My Little Beauty Vitamin Shot Facial Scrub – made with bamboo extract, apricot seed powder and argan oil this twice weekly scrub will buff skin and leave you all shiny. My Little Beauty Easy Morning Skin Perfector – once you’ve rinsed off the scrub this moisturiser softens and smoothes skin with a subtle shimmer. Just remember to top with SPF! This is a great way to use up potatoes left over from a previous meal. Oh and eggs. To make it vegan, just skip the eggs. A quick tip – book the eggs and potatoes in the same pan if you’re using raw potatoes. Boil the potatoes (10 minutes till al dente) and eggs (7/8 minutes till you’re happy they’re done). Brown your onion and toast the cumin seeds, add the ginger and garlic and leave to mingle for 5 minutes. Add your spices and season to taste. Pour in the tomatoes, mix and cook for 5 or 6 minutes. Drain the potatoes and add them and the celery. Mix in well and simmer. When your eggs are done, run them under a cold tap, peel and slice. Add them to the pan for a minute and spoon some of the sauce over them. Serve. You can add raita or yoghurt to serve or your choice of Chutney etc. I don’t tend to serve it with rice because of the potatoes but it’s up to you. I do like a piece of naan to dip. This is based on a recipe from my lovely work wifey whose family come from Gujarat in India. 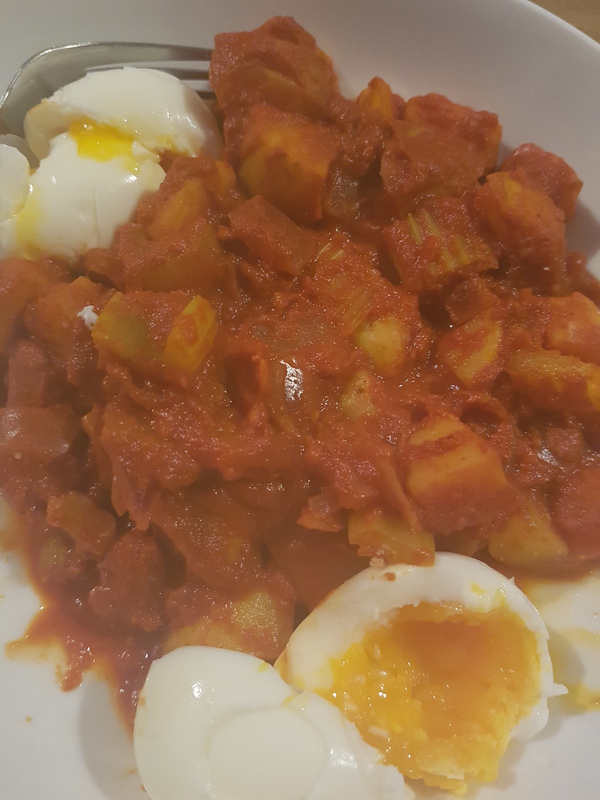 You can use different vegetables to bulk it out and it tastes just as good reheated the next day minus the eggs. We’ve all been there, you’re bloated, your belly aches and you’d quite like to die now thank you. Here’s a quick recipe for a tummy soothing remedy that costs less than 50p to make. Hot water – a little cooler than boiling. Pour the water into the cup and let it cool slightly so you don’t scald your tongue. Peel and grate the ginger. Wash and half a lemon. Put the grated ginger in a bowl and press down on it with a spoon to release the juice. Pour the ginger juice into the hot water (I use a tea strainer) and squeeze in the lemon juice. Sip. Adjust juice levels to taste. Drink slowly and in a while you should feel better. 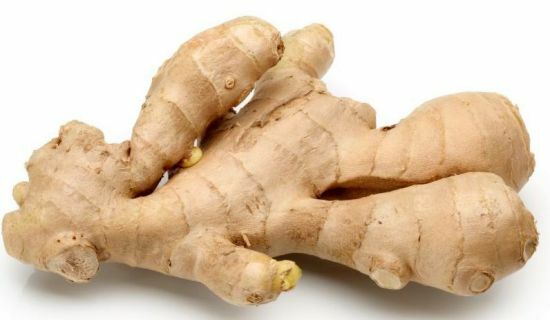 Ginger helps promote good digestion and soothes the bloat. 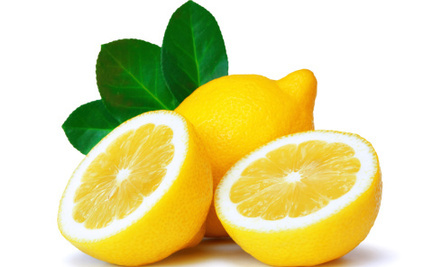 Lemon is a friend to your liver and helps break down chemicals like alcohol. If you can stomach it hot water with lemon is a great way to get your body up and at ’em in the mornings. Personally I found it smelt like pancakes but tasted horrific. The ginger version is definitely better. You could also use fresh mint in warm water as mint also helps the digestive system and has anti-inflammatory properties. Or you could buy some tea bags – whatever works for you. I am not a doctor or nutritionist – this is just a simple home remedy. For anything more serious please see your GP or visit a hospital. Any ongoing pain in your gut must be addressed with a professional as it could be serious.